At Classic Security Solutions we supply, install and maintain a range of alarm systems, all of which have been sourced from trusted suppliers in order to guarantee their quality. We understand the importance of having a security system that is suitable for your home or business which is why we only supply quality products and why all installation and maintenance works are carried out by members of our fully trained, highly skilled team. With all alarm system installations we provide you with the relevant paperwork (N.S.A.I. certificate), ensuring you are compliant with national insurance regulations and entitling you to a discount from your home insurance company. Protect your property from unwanted intruders with one of our burglar alarm systems which immediately notify you of any breaches. We supply, install and maintain a variety of burglar alarm systems with options to suit all requirements and budgets. Additional sensors/keyfobs can be added including smoke/heat and carbon monoxide detector. Monitoring can also be added for an additional cost. Discount of first service if alarm is installed by Classic Security Solutions. If you require an alarm system for your home or business contact Classic Security Solutions now. A proper fire alarm system is one of the most important investments you can make for your home or business, as it has the potential to save your life. We are specialists in the installation and maintenance of all types of fire alarm systems and we are strictly compliant with European Standards. 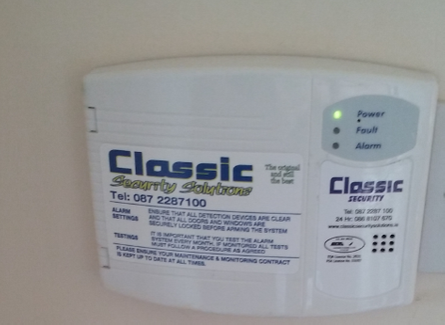 If you need a fire alarm system fitted in your home or business give Classic Security Solutions a call. Fully licensed by the Private Security Authority of Ireland (PSA) and Certification Body EQA.